The Camp Fire in Northern California has become the most destructive and deadliest wildfire in state history, with a death toll of 42 to date. In the southern part of the state, firefighters are battling the Woolsey Fire, which has taken two lives so far. Up to a hundred people are still missing, according to local authorities. I.I.I.’s California representative Janet Ruiz had advice for residents impacted by fires in this CNBC article. Many insurers have deployed mobile units to assist homeowners with filing claims and to distribute debit cards for living expenses. 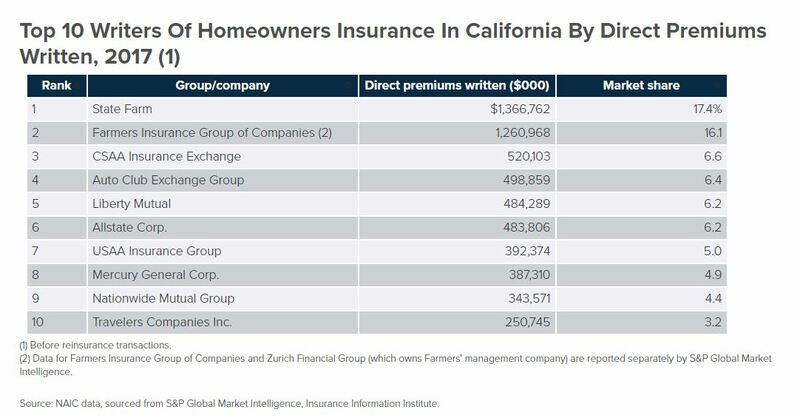 Below are the top 10 homeowners insurers in California. Northern California’s Pawnee Fire began on Saturday, June 23, and is threatening hundreds of homes in Spring Valley (Lake County). 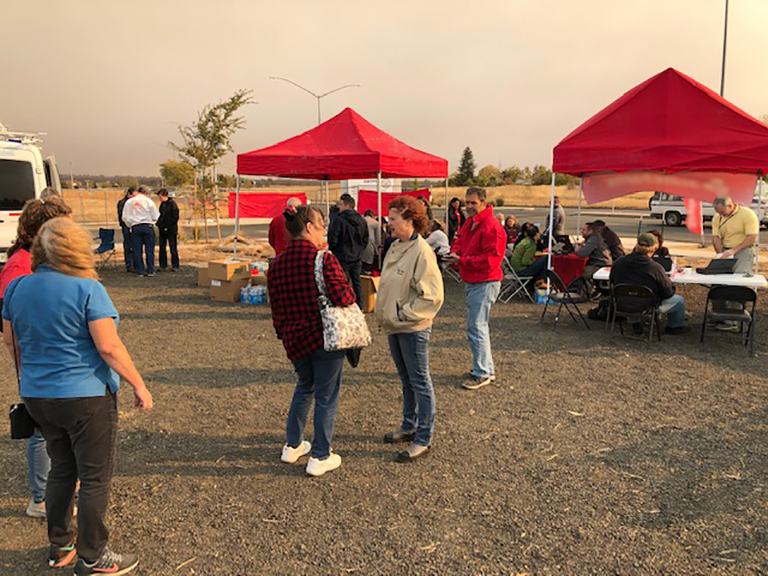 Meanwhile, the Creek Fire started on Sunday, June 24, and prompted evacuations near Happy Valley and Igo (Shasta County). Florida’s Limerock Fire either destroyed or damaged dozens of homes in Eastpoint (Franklin County), with at least 175 residents displaced due to the Sunday, June 24, blaze. Americans are reaching retirement age in worse financial shape than the prior generation for the first time since the Truman administration, a front page Wall Street Journal Weekend Edition story (June 23-24) stated. Catastrophe risk modeling firm RMS puts insured and reinsured losses stemming from the December Thomas fire in Southern California at somewhere between $1 billion and $2.5 billion, reports the Artemis blog. The fire, which started on December 4, became the largest in California history and was followed by devastating mudslides in burned areas stripped of vegetation. RMS estimates include losses from burning or smoke damage to personal and commercial lines and insured losses due to business interruption and additional living expenses. They don’t include automobile and agriculture losses, or damage related to the recent mudslides. The I.I.I. has Facts & Statistics on wildfires here. The I.I.I.’s Michael Barry has been attending the National Association of Insurance Commissioners’ meeting. This week, I.I.I. Daily editor Jennifer Ha picks the week’s most important insurance stories. Record winds are fanning the flames of three major wildfires in Southern California. Already 200 homes and buildings have been destroyed, and tens of thousands of persons face evacuation. Damage claims related to the October wildfires that hit the state’s Wine Country have risen to $9 billion. The state tracks the losses reported to major insurance companies, and the recent losses are far greater than any other wildfire outbreak in state history. The Federal Emergency Management Agency (FEMA) has filed claims with private reinsurers for the full $1.042 billion the agency has in coverage. The claims are being sought to help FEMA recover the losses of the National Flood Insurance Program (NFIP) from Hurricane Harvey. Meanwhile, Congress approved a short-term (December 22) extention for the NFIP. I.I.I. members receive the I.I.I. Daily for the latest insurance-related news for free. Nonmembers can purchase a subscription. Contact daily@iii.org. The worst wildfire season in the history of modern California is taking another bad turn, as three major fires have destroyed more than 200 homes and buildings. Strong winds will be fanning the flames. The state’s foresters have issued a purple wind alert for Southern California, something they have never done before. This follows a Department of Insurance report that insurers have incurred more than $9 billion in claims so far from the October fires, being $8.4 billion in residential claims, $790 million in commercial property, $96 million in personal and commercial auto, and $110 million from other commercial lines. County-level details here. The New York Times has a 2-minute video summarizing why this year’s wildfire season has been so bad. Wet winter followed by hot summer. The moisture encouraged plant growth. The heat turned those plants to tinder. Longer fire season, perhaps linked to climate change. Growing residential areas. Development is encroaching on forests. Santa Ana winds. As noted above, the winds are blowing harder this year. Though the wildfires in California continue, RMS has estimated economic and insured losses between $3 billion and $6 billion, making this collection of wildfires the most expensive ever. According to data from Property Claim Services as reported on the I.I.I web site, the most expensive wildfire previously was the 1991 Oakland Hills fire, which incurred losses of about $2.75 billion, adjusted for inflation. Because the penetration rate for insurance is so high in this region, RMS says its figure represents both economic and insured loss. The range includes loss due to property damage, contents and business interruption caused by the burn component of the fires to residential, commercial, and industrial lines of business. It does not include automobile or agricultural crop losses, smoke damage, or any factor for post-loss amplification. Because of the impacts to the wine industry throughout the region, RMS notes the significant uncertainty regarding the long-term business interruption for this event, which could result in a higher total loss. It is important to note that these events are still on-going and the perimeters of the active fires may change significantly before containment. Therefore, these exposure and loss estimate are considered preliminary and are representative of the current situations.